Welcome to my Data Visualization Diary series! I’m devoting time this year to learning how to use my data and analysis skills from my previous work in research to develop effective and fun communication tools. In this section of my blog, I plan to write about the journey of exploring a data set, trying to find the interesting stories that the data contains, and practicing techniques for using images to communicate the stories that the data has to tell. Through these experiments, I hope to learn what visuals work well, and which fail to communicate in an interesting, efficient, and understandable way. Please, comments and suggestions welcome. 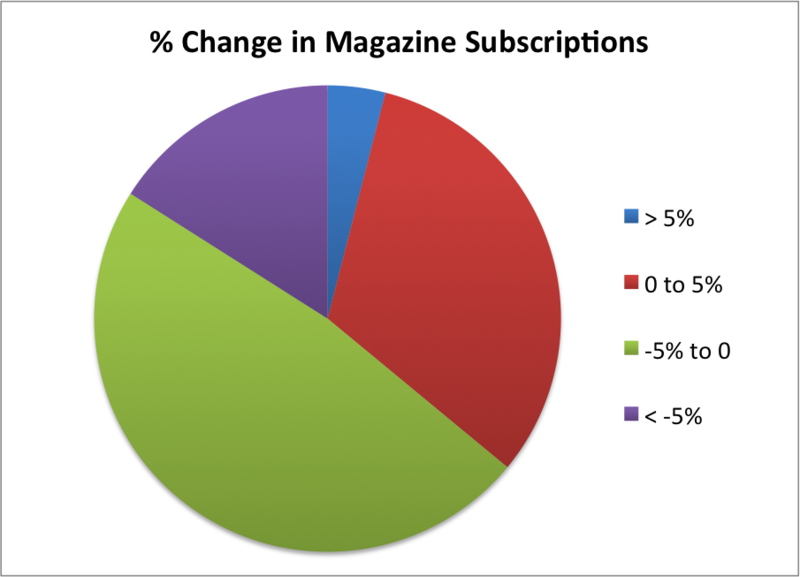 In this post I explore the sales data from the past two years for top magazines, looking for trends that could imply who I should plan to make a living writing for in the future. In this post, I discuss with Google’s n-gram viewer, a online tool that lets you build your own simple data visuals of representing the changing trends in word usage in the English language over time. I read some fascinating research describing the serious data analysis that can be done with this data set, and what it can prove. I wrote this post on my other, which is devoted to everything food and science. It’s another post playing with Google’s n-gram viewer, this time looking specifically at trends in health food fads, vitamin science, and when we started worrying about GMO foods.